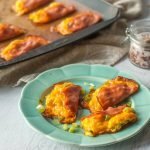 These low carb breakfast ham tacos are an easy to make grab and go breakfast. Make a batch and freeze for later. Only 0.7g per serving. Add butter to a pan to melt. Scramble eggs and mix in pepper and onions. Add eggs to pan and cook. Lay a piece of parchment paper or a silicone mat on a cookie sheet. Assemble by adding a bit of scrambled eggs on one side of ham and then lay a half piece of cheese on top. Fold over and place on cookie sheet. Continue with all ham slices and bake for 10-15 minutes until cheese is melted and ham is a bit crispy. Store in a container or baggie and freeze. Only takes 1 minute in the microwave to heat up.